On the day before the 2005 Regata Storica, I was riding the vaporetto past the church of Santa Maria della Salute. 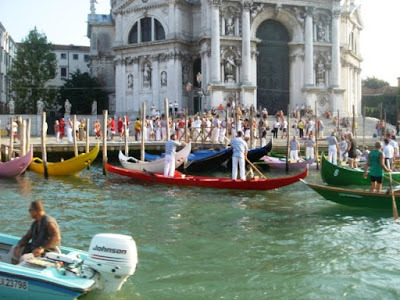 I noticed that many, if not all of the regata boats belonging to the Commune di Venezia, had congregated there. It was a colorful spectacle. 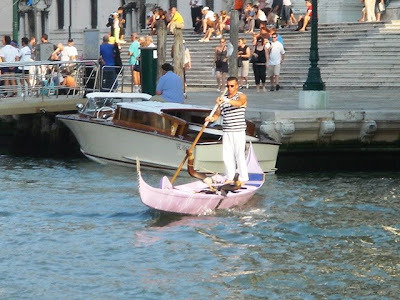 I took a number of photos with multiple boats in the shot, but I've always liked this individual photo of a pink gondolino; it's a funny display of contrast - a macho boat painted such a feminine color. It also gives us a good idea just how small and lightweight these racing boats are. I recently heard that Sean Jamieson at The Gondola Company in San Diego owns North America's only gondolino. Way to go Sean. I'm definately jealous. I'll bet you didn't paint yours pink. Of course, if I had one, my two daughters would campaign hard to paint it a girlie color.